Talk to me, Tivo: Michael strikes up a friendship with the 5-year-old daughter of his enemy when children visit the office. Jam Cam: The office is being visited by kids, which is ok with Pam as long as she just gets at least one to like her. She’s got lots of candy to help her out because she apparently is channeling the witch from Hansel and Gretel. Meanwhile, Jim’s mind is oddly on the same track as Dwight’s as they correct Michael on the location of Superman’s hometown. Nerds. Pam tries to pull Abby, the daughter of Kevin’s fiance, into her candy-covered ginger bread house to no avail. The kid apparently is more interested in her book. Which one? asks our favorite sales boy. The Mixed-Up Files of Mrs. Basil E. Frankweiler. Best book, but she’s read it before. Jim seems to have her taste in books and they both agree they would rather stay overnight at the aquarium instead of the Met. Abby finds all this intelligent literary talk with Jim very endearing and decides to help him sell some paper. Too cute! In fact, I think Abby may have a little puppy love for the sales guy so she breaks his hand. Well, Jim pretends she can break his hand but Dwight sees right through that little charade. For being so mean, Meredith’s kid calls Dwight “Mr. Poop” and Jimby have a cute little snicker over it. 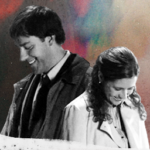 In the conference room, Jim, Pam and the rest of the office get stuck watching a tape of Michael as a kid only to have Michael realize his dreams as a child have not been fulfilled. Jam get genuinely worried about him when he barricades himself in his office. Pam, however, gets quickly distracted by Roy giving noogies to Meredith’s kid. As she rolls her eyes, you can just here the thought in her brain: “Why is Roy acting like he’s as old as the kid?” The smirk on Jim’s face pretty much shows that he’s thinking the same thing. But wait…that obnoxious kid that Roy was horse-playing with seems to have a bit more to him. Well, he mainly wants sugar and destruction, but that’s ok with Pam since she bought the candy to lure in a little shredding buddy. Meanwhile, Jim’s little crush gets the nerve up to ask him to dinner. Unfortunately, he has plans tonight already. Jim, you’re breaking Abby’s little heart! Oh, and from the look on Pam’s face, you’re breaking her heart, too. Teach your children well…to never let Dwight and Michael perform any kind of music at the end of Take Your Daughters to Work Day. As Pam basks in the beautiful sound, she turns to make one last sarcastic comment to Jim, who isn’t there. It seems he’s checking out a bit early for that big date tonight while Pam once again heads home with The Noogie Guy. The Others: It’s Take Your Kids to Work Day and the kids seem as messed up as the adults. Stanley’s daughter tries to hit on an older man, making Kelly jealous and causing Ryan to get an earful. Meanwhile, Michael becomes friends with Toby’s kid. Awkward. Somehow, Sasha sees something in Michael that Toby doesn’t — or Michael just has alot of toys in his office. Meredith’s kid, however, is all about misguided mayhem. A kid like that would never grow up in a Dwangela household. What have we learned today, kids: Teach your children well so that they may read good books to bond with sales guys and bring out the softer side of the harshest employees. Oh, and if given a choice, spend a night in The Met. What fun is an aquarium if the otters are asleep? Pam: I’m actually looking forward to take your daughter to work day. I am not great with kids, but I want to get better because I’m getting married. So I put out a bunch of extra candy on my desk so the kids will come talk to me�like the witch in Hansel and Gretel. Pam: Oh, I have more. Michael: It’s Pam, Ms. Beesly if your nasty. Michael: Oh, God. Is that today? Pam: I reminded you last night. Michael: Well, I’ll be in my office. Pam: Don’t you think you should say something? Michael: Fine, fine, fine, fine, fine! Hi children. I’m Michael Scott and I am in charge of this place. Uh, how do I make you understand? I am like Superman and the people who work here are like citizens of Gotham City. Michael: Okay, I’m Aquaman. Where does he live, guys? Michael: I work with a bunch of nerds. Pam: Hey Abby, do you wanna help me shred some old documents? It’s actually pretty cool. Pam: I only have one goal today. To make one kid like me. Just one. Jim [to Abby]: What are you reading? Abby: From the Mixed up Files of Mrs. Basil E. Frankweiler. Abby: Yeah, but I read it before. Jim: So have I. Hey, question: if you had to spend the night in the Met or the aquarium, which would it be? Jim: Definitely, yes! Glad you said that. You don’t want to help me with some of my sales, do you? Because I’m kinda swamped. Jim: Yes! And you’re Abby, right? Jim: I’m Jim. Let’s sell some paper. Jim: Let’s start with your mom. Pam: He’s not coming out. He won’t pick up the phone. Jim: I can’t believe his mom dressed him like that. That’s the real tragedy. Roy: Pam, Pam! [has kid in a head lock] I love this guy! Jake: Is it okay if I take one? Jake: Is your job hard? Pam: It’s not too bad. I get to shred things sometimes. Do you wanna see? Pam: Ok. Um, here it is. Don’t put your fingers in there. Cool, huh? Pam: Yeah, I get to do this, like, every week. Jim: Why does he own a guitar if he doesn’t know how to play it? Pam: I think he thought his ukulele skills would transfer.